Although the sealing industry was in decline at the turn of the century,Newfoundland companies continued to fit out steamers for the hunt. More powerful and stronger steel-hulled steamers were introduced in 1906, and by 1914 Newfoundland had the "finest fleet of sealers and ice-breakers in the world" (Mosdell 26). During World War I these steamers were either transferred to war service or sold to Russia for winter use. The size of the sealing fleet throughout the 1920s fluctuated between eight and 12 ships until 1929, when world prices for seal oil had improved to the extent that four new, more powerful steamers were added. The depression years of the 1930s, however, were particularly harsh in Newfoundland; for the first time in a century the number of sealers dropped to fewer than 1,000 men. The remaining vessels in the sealing fleet were again pressed into service with the outbreak of World War II. In 1943, for the first time in almost 150 years, no vessels ventured forth in search of the whelping patches. The end of the war marked the beginning of an entirely new chapter in sealing. Smaller motor vessels were used. Improved prices for seal products, favourable ice conditions, and an apparently revitalized stock caused a revival in the seal industry. In 1947 the sealing fleet consisted of two steamers and 15 motor vessels. This resurgence, though, was dampened somewhat by new competition from foreign vessels. Norwegian and Canadian interests based in Québec and Halifax forced the gradual withdrawal of Newfoundland entrepreneurs from the seal fishery. 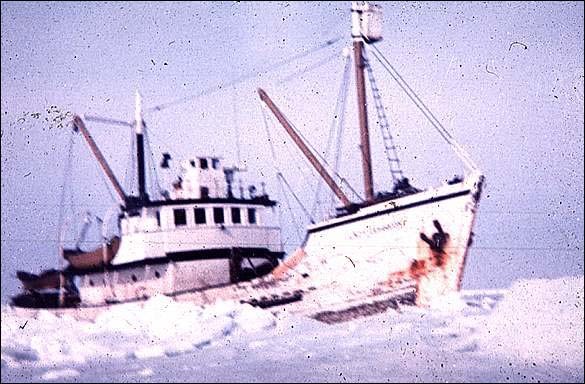 In 1969 only one Newfoundland vessel, the Chesley A. Crosbie, sailed for the ice, and in 1970 and 1971 she was joined by a small motor vessel, Lady Johnson. A small Newfoundland and Labrador owned motor vessel hunting for seals in 1972. Reproduced by permission of C. W. Sanger © 1972. While the offshore operation declined, there was an increase in the landsmen effort, now defined by the Canadian Department of Fisheries and Oceans to include small boats and longliners under 20 m. in length. Reproduced by permission of C. W. Sanger © 1998. Since the 1960s, the eastern Canadian seal fishery has been embroiled in controversy. Concerned by allegations of ineffective management and inhumane killing methods, animal rights and conservation groups began a sustained campaign against the sealing industry. The Canadian government, which is responsible for seal harvesting, responded with more stringent regulations and quotas intended to ensure the humane killing of harp and hooded seals, and the survival and expansion of the herds. Anti-sealing campaigns have severely damaged markets for seal products. Rural economies in Newfoundland, Labrador and parts of the Maritime provinces, already fragile, have been further weakened as a result, and current efforts to expand and diversify the industry are facing severe obstacles. A connection between the growth of the seal herds and the collapse of the cod fishery in Newfoundland and Labrador waters remains unclear. However, their coincidence has generated both argument and acrimony.